During an eye clinic visit, I saw a Googly eyes wall art and had saved the project idea for Halloween. They had just glued Wiggly eyes on a paper and framed it. It's a super simple craft, perfect for kids! I removed the glass from the picture frame and replaced it with the colored black paper. There were some unpaired, single eyes in the pack. We glued them on the frame. Do you have the feeling of being watched? CJ loved her art work. As soon as dad came home, She showed him and said "Daddy you're being watched!" 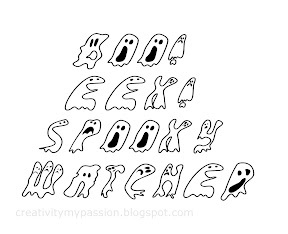 I used Picnik software Halloween fonts and created the below Halloween words template. We took print out and cut the letters out. We used Washable glue(Elmer's no run school glue) and glued the letters on the frame. So that we can remove the letters out and reuse the frame after Halloween. Fun! Made me smile! Love all the "Spooky" words too.. Thanks again for sharing on Kids Get Crafty! oh, no I get the feeling someone is watching me! :) Such a cute & fun idea & great for Halloween! thanks for sharing on the sunday showcase - shared on Facebook & twitter! love it, such a great idea! thanks so much for sharing on Craft Schooling Sunday! soooo cute...!! Perfect for kids craft ...! !